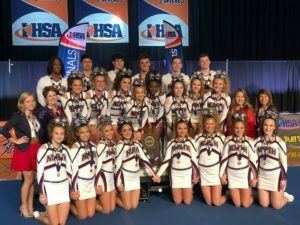 Belvidere North High School has taken the state title in coed competitive cheerleading for the third straight year. Belvidere North has won a third consecutive state championship in coed competitive cheerleading and its point total gets higher as the first-place trophies continue to mount. Meanwhile, neighboring North Boone took third in the small school division for its best finish ever. Belvidere North has now won a place at state for seven straight years. It was ninth in 2014; sixth in 2015; second in 2016; and first in 2017, 2018 and, now, 2019. North won the Grayslake North sectional one week ago with a total of 94.53 points. It was first in Friday’s preliminaries at state, with 95.71 points. And in Saturday’s finals, the Lady Blue Thunder amassed 96.63 points, which was 3.20 more than the runner-up, Plainfield South. North totaled 93.29 points while winning its first title and 93.97 when it captured its second championship. North Boone scored 83.27 points, which was good for fifth in Friday’s preliminaries, then recorded 85.16 points to move up two places, to third, with was .24 of a point out of second. The Lady Vikings also were at the Grayslake North sectional, where they scored 80.91 for fourth place and a berth at state. The Top 5 in a field of 14 entries qualified for state. North Boone wound up seventh in the state last year, with 81.20 points. The IHSA crowned four of state champions today at Grossinger Motors Arena, as the 2019 IHSA Cheerleading State Finals concluded!